Day 30: The Golden Guardian! 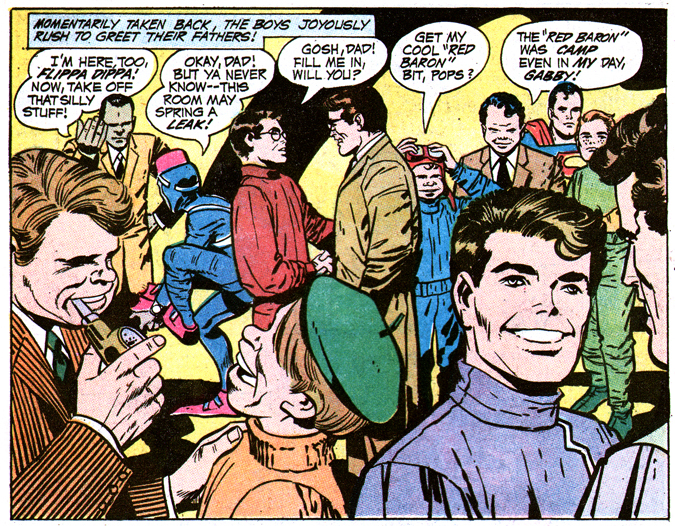 Posted 31 October 2010 in Day Entries, Earth, Heroes, Jimmy Olsen #135, Supporting Characters. Talk about an in-your-face ending to this ish! Here, comin’ rightacha, is the return of one of Jack and Joe Simon’s great 1940s super-hero creations (the last costumed hero the pair initiated for DC during the WWII era), The Guardian! Originated as a guardian angel of a group of paperboys, in 1942’s Star Spangled Comics, the adventurer is actually Suicide Slum beat cop Jim Harper, who apparently can justify his nightime vigilantism. The group headlined SSC until their disappearance after the war. 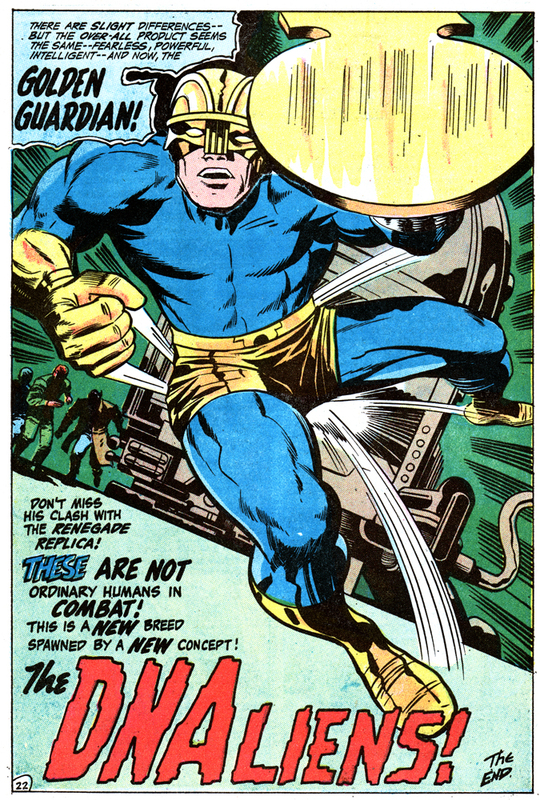 To be frank, The Guardian was a bald-faced swipe of S&K’s greatest creation, Captain America, right down to the shield (though the DC character’s accessory was in the shape of a police badge), only without the “Old Glory” color scheme and Harper didn’t have just one kid sidekick — the rookie-by-day had four: Scrappy, Gabby, Tommy and Big Words! Admittedly, The Guardian, with his great cyan-&-gold ensemble (was the helmet gold-leafed? ), served as permanent guest-star within the breathless exploits headlined by The Newsboy Legion, but the audacity of S&K of virtually transplanting Timely’s “Sentinel of Liberty” and making a home for him at their new publisher, The House of Superman, was exhilarating and apropos of the creative team’s tenacity and chutzpah. (The duo suspected they were being cheated out of royalties by Timely publisher — hence their move — and they only produced ten issues of Captain America Comics… but, boy oh boy, what star-making issues they were!). Here was a S&K action hero smashing, punching, flying, exploding from the page… Yowza! I’ll confess, too, that though I had zero prior knowledge of the character, upon first seeing this very same final page of Superman’s Pal, Jimmy Olsen #135, The Guardian instantly became one of my favorite super-heroes (a very short list). Why he’s never caught on in the “DC Universe” to much of a degree is a shame; maybe because he’s a Cap rip-off? 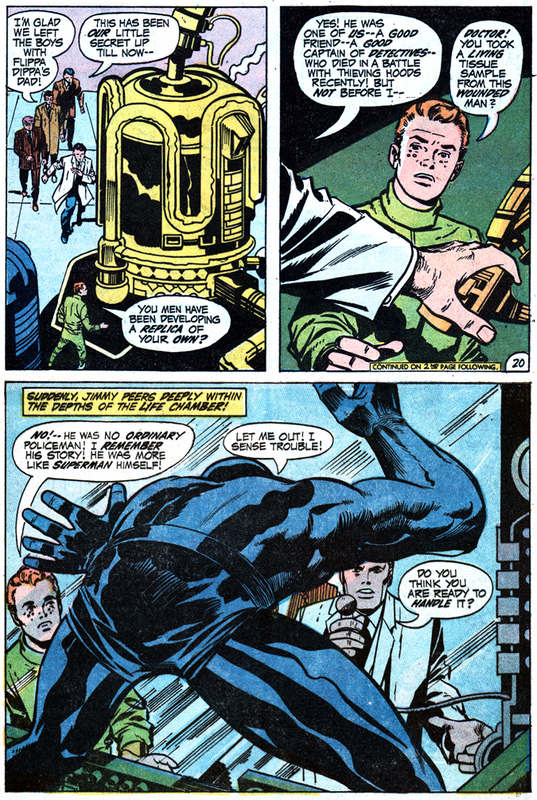 But that’s one of the main reasons I dig the hero — it’s S&K stealing from… S&K!!! 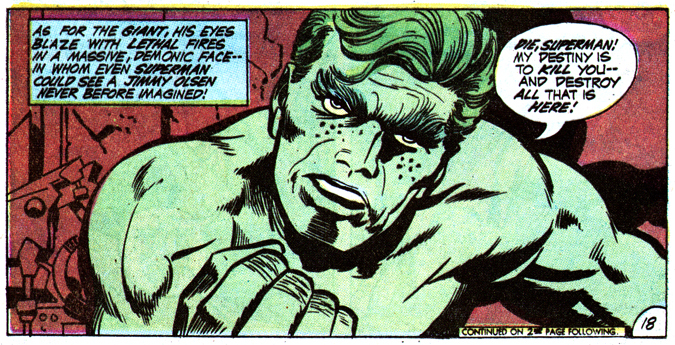 Alas, Jack never expanded on these tantalizing hints of storylines to come, and while the hero only guest-starred in a small handful of JO stories during the Kirby run, The Guardian of Metropolis was a joy to behold! Day 29: The Project’s Life Chamber! Posted 30 October 2010 in Day Entries, Earth, Jimmy Olsen #135, Weapons & Devices. Are you folks ready for one of the biggest debuts in the Fourth World run? Well, watch out! He’s almost here!! 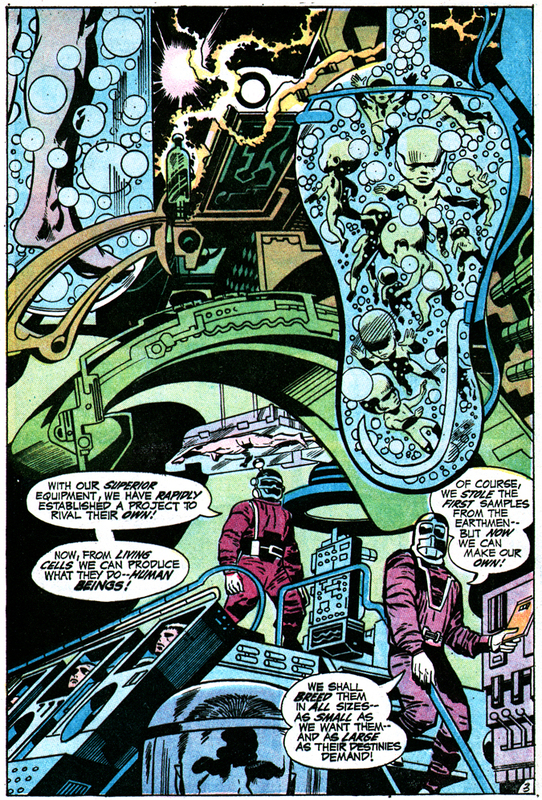 Hang tight, Kirby fans!!! A Golden-Age “newbie” is coming rightatcha!!! Day 28: The Incredible Jimmy! Posted 29 October 2010 in Day Entries, Earth, Jimmy Olsen #135, Villains. I am led to believe that Jack did have some big plans for Superman in his Fourth World mythos (later recognized by stalwart creators including John Byrne and Bruce Timm, in comics and animation respectively, who both integrated elements of the Apokolips-New Genesis War into their own Superman projects), and the more you think about the melding of the two — Superman and Super-War — the more apropos the connection. 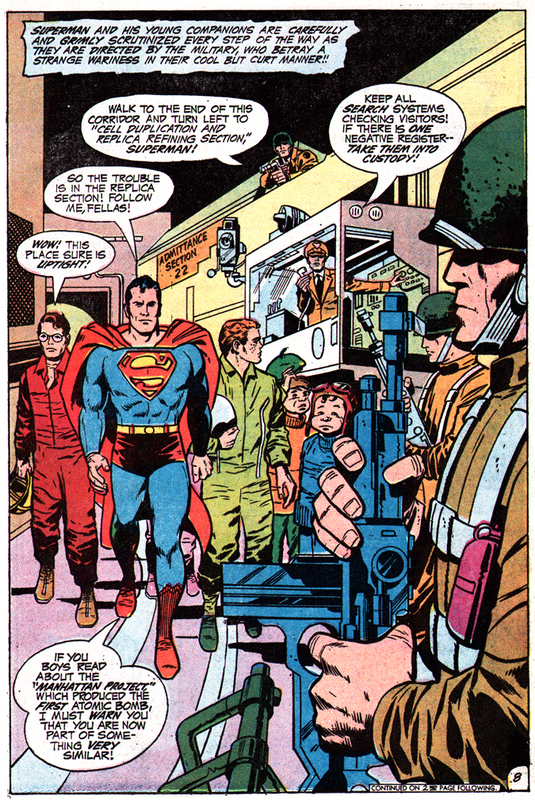 I’ll wax on when we discuss Supes’ guest-star turn in The Forever People #1, but just gotta say, man, what coulda been! It’s a delightful twist to have another freakish version of Jimmy tramping through the pages of his comic book, one that harks back to the wonky Weisinger-edited tales of Jimmy as a werewolf, or giant turtle man, or super-fat man, stories that were actually a lot of fun, if rankly juvenile. For the life of me, I can’t imagine Jack sitting down and reading the JO run before commencing on the title, but still, it’s a nice echo, whether intended or not. It’s interesting, too, that the creature has a certain resemblance to another giant green behemoth prone to rage, one The King co-created at the competition nine or so years earlier, though where’s Green Jimmy’s purple pants? Watch out, kids, OLSEN SMASH! Day 27: The Penetrator Beam! Posted 28 October 2010 in Apokolips, Day Entries, Earth, Jimmy Olsen #135, Weapons & Devices. Have ya wondered how Simyan and Mokkari are able to steal through the super-tight security of The Project to swipe cloning technology and DNA samples? 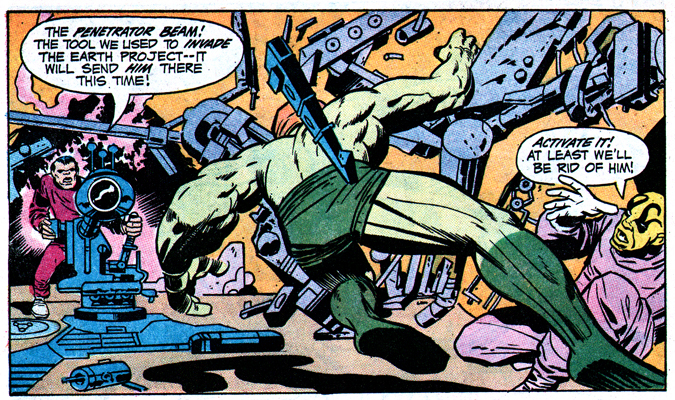 Ponder no more as the caveman-looking Apokoliptian agent whips out the handy Penetrator Beam ray cannon, which Simyan uses to zap the berserker, a not-so Jolly Green Giant rampaging through the Evil Factory, out of their hair and into The Project to kill… (gulp!) The Man of Steel! Day 26: Jimmy Olsen XLIII! 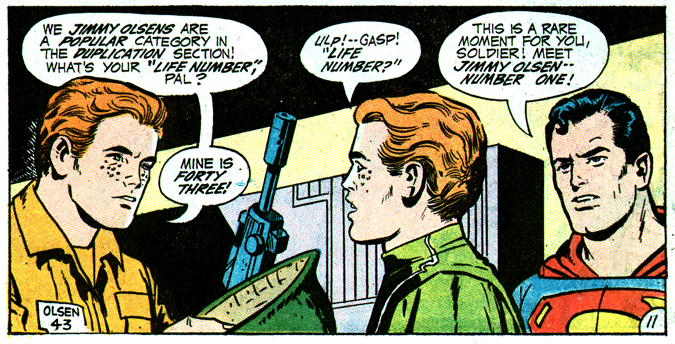 Posted 27 October 2010 in Day Entries, Earth, Jimmy Olsen #135, Supporting Characters. Wouldn’t you think, coming face-to-face with a clone of yourself, grown from cells taken from unsuspecting you during a routine workplace medical check-up, wouldn’t you be the tinsiest bit concerned that your D.N.A., the essence that is you had been stolen and there were hundreds of your duplicates being used by the government in place of “authentic” humans? Apparently not our intrepid Daily Planet reporter, James Bartholomew Olsen, who greets a double — designated Jimmy O. 43 — with no more than a startled gasp, while he takes a tour of The Project hosted by his pal, the Man of Steel (who knew the cell tissue of Jimmy, the Newsboy Legion, and even his impervious self was being nipped). Consider the ethical implications! Would this lead to a Blade Runner-like future? 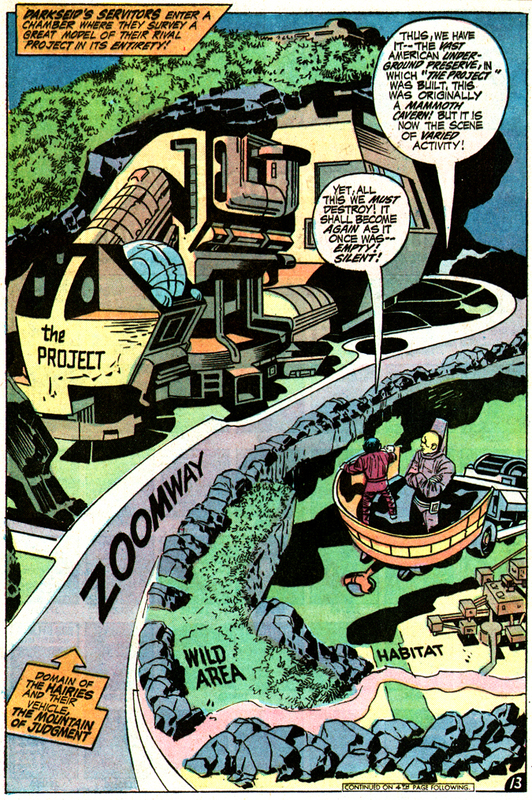 Posted 25 October 2010 in Day Entries, Earth, Jimmy Olsen #135, Locations. At least The Evil Factory is upfront with its intentions! Day 23: Mokkari & Simyan! 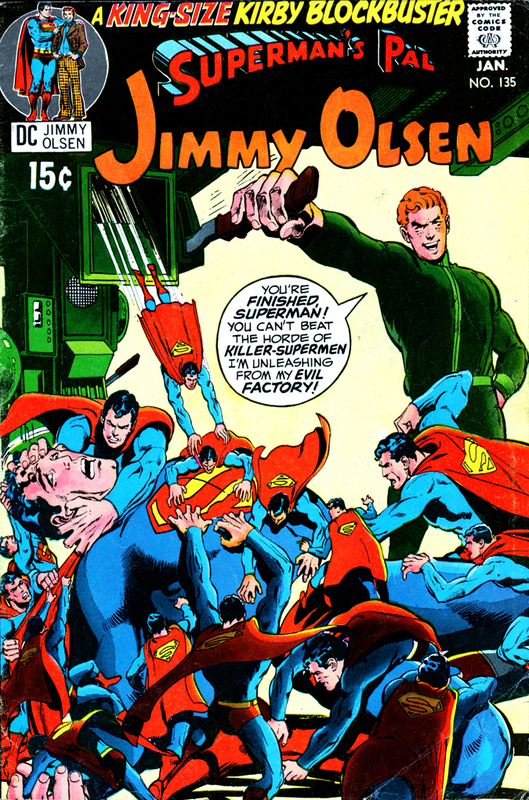 Posted 25 October 2010 in Apokolips, Day Entries, Jimmy Olsen #135, Villains. 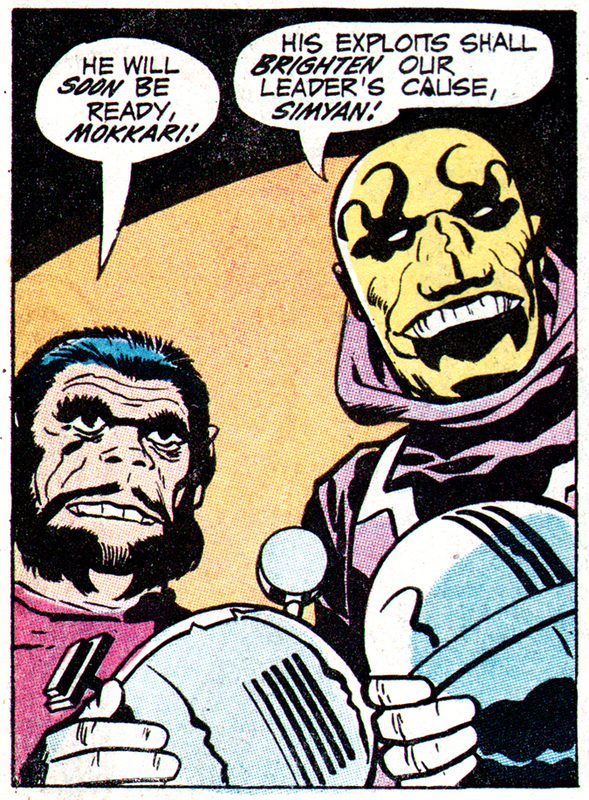 ANYWAY, there’s a slight bumbling aspect to the pair — like they are always screwing things up and desperate to avoid Daddy Darkseid’s punishment — and for bad guys engaging in horrific experiments to serve the Greatest Threat To Earth EVER, hand it to Jack for some innovative character development! I still can’t get over what a cool facial design the Yellow Man sports! Nice stuff for a third-tier cast member. Day 22: The Evil Factory! Posted 23 October 2010 in Day Entries, Earth, Jimmy Olsen #135, Locations. Things start to get truly foreboding with our first wide-angle look at the Apokoliptian “rival Project” called The Evil Factory, run by the sinister odd couple, Mokkari and Simyan. Allusions of the Auschwitz-Birkenau laboratory of Josef Mengeles, the Nazi doctor called “Todesengel” — The Angel of Death — who conducted horrific genetic experiments on concentration camp inmates at the notorious Nazi extermination camp.